Esplanade 54 is a new fully self contained house located in the coastal town of Margate, this home away from home sits right on the edge of North West Bay. The house is 20 minutes south of Hobart and the Huon with lots to do within walking distance. Within walking distance there is a large park, perfect for children and adults. There are tennis courts, bike and walking tracks and a large enclosed children's playground. Opposite the park there is a jetty and boat ramp; great for a quick fish. 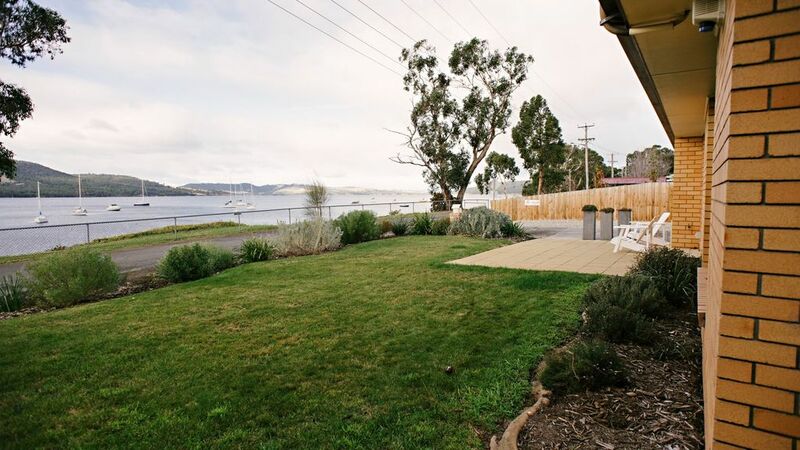 Esplanade 54 is 20 minutes from the Bruny Island ferry and a large plethora of activities and attractions. Including wineries, bush walks, beaches and plenty of places to eat. It really is situated in an ideal position. And, if you don't want to drive anywhere, you can sit and look out on to the water and relax. Esplanade 54 sleeps 7 people with the option of an 8th person on a pull out mattress or using a porta cot. Please enquire about sleeping the 8th guest. Esplanade 54 sits right on the edge of North West Bay and has uninterrupted views from its living spaces. We had such a fabulous time here in Margate. The house had everything you could ever need and then some. Such a quiet and beautiful location. Would definately recommend staying here to anyone. The only thing I would change would be to have a few more towels and wash cloths but otherwise it was oerfect! We're really glad you enjoyed your stay. very clean and tidy. lots of space inside. ( only a small issue as we had little kids.} but overall would rent again. was a great position close to parks and shops. Lovely comfortable home. Very clean and tidy. Good location over looking the water. Quiet and peaceful. Everything you needed for a family of five. Lovely little surprise on arrival. Beds are comfortable. Would recommend this lovely home. Thank you Leah and team. Thanks for your review Matthew - we are so glad you enjoyed your stay! Beautiful, unbelievable views incorporating sea and woodlands. Spacious accommodation and backyard. Very comfortable beds and additional TV viewing room. Would stay there again without hesitation. The provision of some little things like shower gel, tissues, and basic condiments eg vegemite, jam and honey would add to overall quality of accommodation.